Among the many challenges poor and homeless Americans often face is access to clean drinking water and restroom facilities. Add to that the public misconception that the homeless and poor are either lazy, addicted to drugs and alcohol, have some sort of mental illness, or all of the above, and you have a prescription for personal failure. Denial of basic needs like access to clean drinking water violates international human rights standards, according to a report issued by a United Nations investigator earlier this year. A United Nations Special Reporter on the Human Right to Water and Sanitation visited the United States in late February, 2011 at the invitation of the U.S. government and it was discovered that homeless individuals around the country not only struggle to access running water and restroom facilities but increasingly face criminal and civil sanctions when they improvise solutions. The right to safe drinking water and restroom facilities is a part of the Universal Declaration of Human Rights and the International Covenant on Economic, Social and Cultural Rights. The U.N. report’s findings detail just a few of the ways that U.S. cities and counties are failing to meet these obligations because of how they deal with homelessness. Although the Department of Housing and Urban Development (HUD) found that homelessness grew very little between 2009 and 2010, their report shows that there were still 700,000 individuals in the U.S. who were homeless. This number is a less than accurate total since many of the homeless make sure that they are not found by volunteers who perform the count. The HUD report found that the share of families who lack a place to sleep continued to grow during the recession. The elevated unemployment rate and the large number of foreclosures have increased demand for services to the poor and homeless but city and state budget problems have led to a reduction in those services. As a result, many communities are confronting an increasingly visible homeless population forced to sleep in city parks or take up residence in one of a growing number of tent cities. Some cities have begun to regulate tent cities and in many cities, developers, businesses, and city councils have clashed with the homeless. Some have even encouraged police to issue tickets for violations such as sleeping in public and loitering. Others have begun shutting off the water supply to nearby water fountains and locking or removing public restroom facilities in an effort to discourage homeless individuals and families from taking shelter in the growing tent cities. Rather than doing good things like providing more housing, more shelter, and more assistance, cities are using current laws and ordinances, normally not enforced, to push the homeless problem out of view. In Omaha, where I live, community leaders as well as the police department do much to alleviate the struggles of the poor and homeless. But in many other cities the people who are supposed to be helping the homeless are the very ones who work against them. The writer is a 55 year old white male with a university degree, decent clothing, and a nice looking watch, and basically a target for anyone who wants a buck, a cigarette, or a new piece of whatever he owns. He has had two sweaters stolen after having mistakenly left them out to dry on top of his locker after a light rain. Although there are many social workers who work diligently and honestly to help the poor and homeless, the system in many cities only serves to promote the perception that something is wrong with them and they must be watched carefully. After all, it’s tax payer money at work here. Ironically, it is somehow ignored that many of these homeless people have worked hard most of their lives and have previously paid those same taxes. The National Law Center on Homelessness & Poverty is planning a series of cases to challenge ordinances that criminalize activities — such as using the restroom, sleeping or accessing water — that cannot be avoided or handled in private if a person is homeless. These laws violate international standards and amount to what a U.N. investigator said was cruel and unusual punishment. And where is the Church in all of this? Should not the Church be the ones to lead the fight against homelessness? If what was done to the homeless in cities across the country were done to the victims of tornados, fires, and earthquakes, there would be an outcry from the religious community as never before. It doesn’t matter how a person became homeless. 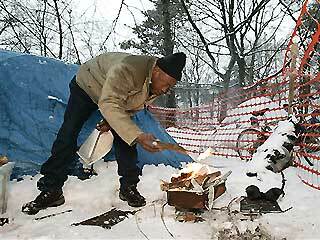 They remain homeless just the same until they are allowed the basic necessities that most of us take for granted. Unfortunately, for the most part, the Church has the same misconception about the homeless as the rest of the world. Perhaps it’s not so much alcohol and drugs that brought some to be homeless; maybe it was being homeless that brought some to abuse alcohol and drugs.